No one expected Canada to lose against the Swiss on Tuesday, but Thursday's semifinal against the Czech Republic will pose a tougher test at the world junior tournament in Buffalo. Switzerland head coach Christian Wohlwend was right on the money. Just as he stated, the Canadian juniors were faster, bigger, stronger, could shoot better, pass better. 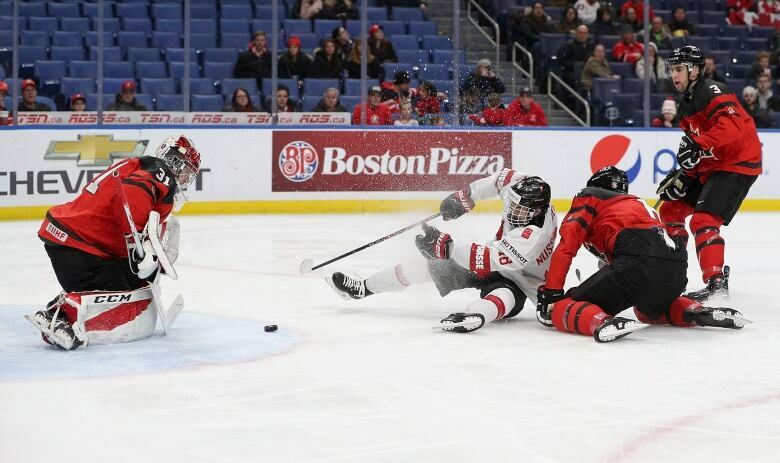 Canada could do everything better and proved as much in its 8-2 quarter-final victory against the overwhelmed Swiss at the world junior tournament on Tuesday in Buffalo. Wohlwend wasn't trying to play "mind games" with Canada with his remarks on Sunday as suggested in some circles. The 40-year-old Swiss coach, who was born in Montreal because his father managed a hotel there in the late 1970s, is a candid and honest person. But his honesty did his kids no favours. How would you feel as a player if you're coach uttered those remarks? Yes, the Swiss had no chance in this one. Most members of the sparse crowd of 5,533 who braved the blizzard conditions to make it to the KeyBank Center weren't settled in their seats when Brett Howden of Oakbank, Man., scored 48 seconds into the game. The score was 3-0 after the first period and 6-1 following 40 minutes. After that, it was a matter of finishing the game without developing bad habits — which happened when Canada gave up a shorthanded goal in the third period — and suffering any serious injuries. The Canadians already were without Victor Mete, the defenceman from Woodbridge, Ont., who has played for the Montreal Canadiens this season. His injury stems from a hit he absorbed into the end boards on the last shift of Canada's loss to the United States in the outdoor game on Friday. Mete saw limited minutes in the team's preliminary-round finale against Denmark on Saturday evening and was excused from practice on Monday. 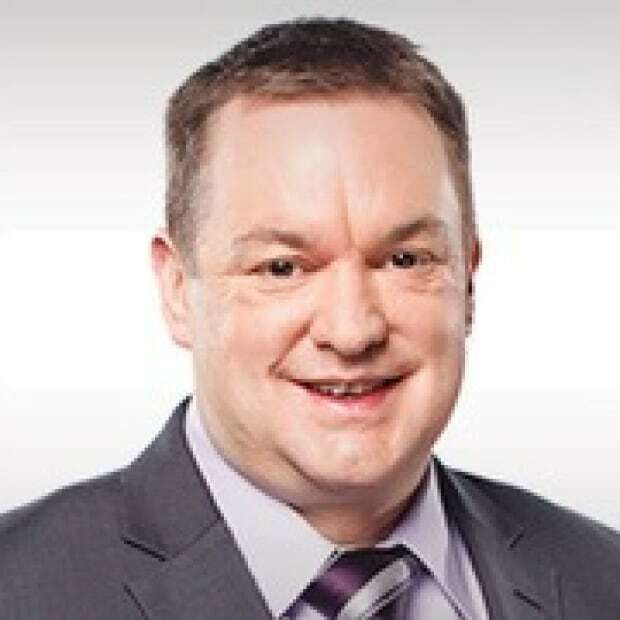 Despite Canadian head coach Dominique Ducharme's claim that Mete's undisclosed ailment wasn't anything serious and that he would play against the Swiss, Mete watched the game from the stands. Mete is expected to return in time for Canada's semifinal game against the Czech Republic on Thursday. The Czechs will no doubt pose a much bigger challenge than Switzerland. The Czechs surprised Finland with a 4-3 shootout victory in the first quarter-final matchup on Tuesday. That result was not that much of a shocker. The Czechs have a strong goaltender in Josef Korenar, a San Jose Sharks prospect, and have eight players on their roster who performed for the Czech Republic when it defeated the United States 4-3 in the final of the under-18 Ivan Hlinka Memorial Tournament in August 2016. One of those players, Filip Chytl, began the season with the New York Rangers. Another, Filip Zadina, scored two goals, including the game-tying marker with two minutes and 26 seconds remaining in regulation to send the game into overtime on Tuesday. Zadina hails from Pardubice and is the son of former Czech league player Marek Zadina. The 18-year-old Zadina has increased his stock for the 2018 NHL draft and has been buoyed performing at the world junior tournament in Buffalo in the same building as Pardubice legend Dominik Hasek. He also is familiar with Canada's game. He's in his rookie season with the Halifax Mooseheads of the QMJHL, having scored 24 goals in 32 games before he joined the Czechs for this tournament. Zadina isn't the only Canadian connection for this Czech team. It has 10 players who are developing in the junior ranks of the Canadian Hockey League, including undrafted Kristian Reichel of the Red Deer Rebels. Reichel is the son of former Calgary Flames and Toronto Maple Leafs forward who won bronze medals in this tournament in 1989 and 1990. 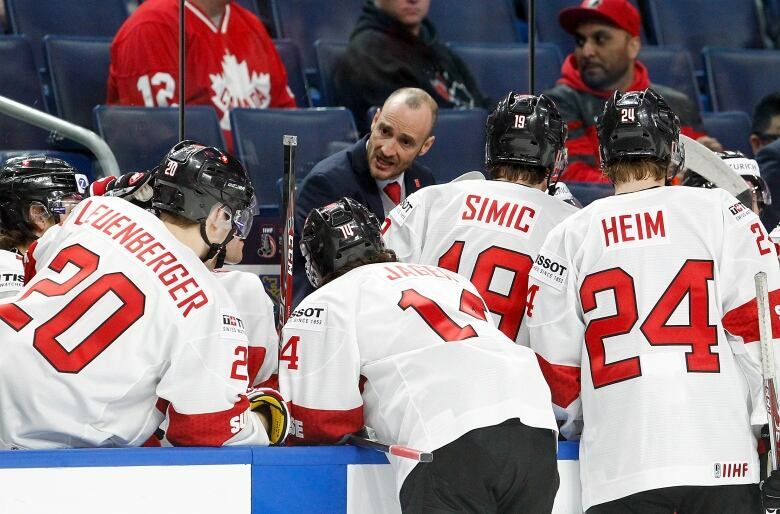 Another Canadian connection is Czech head coach Filip Pesan. He played briefly for St. Francis Xavier University in Antigonish, N.S. two decades ago. No doubt Pesan won't make any Wohlwend-like remarks about his team in the next couple of days. The Czechs, after all, have exhibited they have a chance against Canada.